On Sale Now! Free Shipping Included! Save 9% on the D-Link Systems AC1200 Wi-Fi PCI Express Adapter (DWA-582) by D-Link at AABX. MPN: DWA-582. Hurry! Limited time offer. Offer valid only while supplies last. With the D-Link AC1200 Wi-Fi PCI Express Adapter (DWA-582) you can upgrade your desktop PC to add the latest generation wireless AC technology. With the D-Link AC1200 Wi-Fi PCI Express Adapter (DWA-582) you can upgrade your desktop PC to add the latest generation wireless AC technology. Designed with high-gain external antennas and Dual Band technology (both 2.4Ghz and 5GHz) the DWA-582 provides performance up to 4 times faster than previous-generation Wireless N, meaning that you can stream HD movies, transfer large files, and enjoy lag-free gaming from more places throughout your home or office. 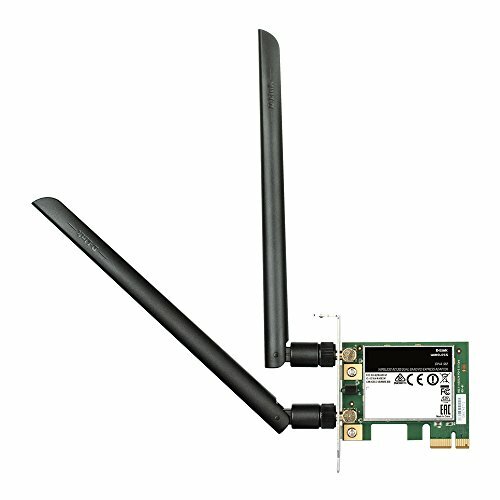 The D-Link AC1200 Wi-Fi PCI Express adapter is backward compatible to existing Wi-Fi networks and provides an optimal experience with an AC1200 Wi-Fi Router.